We are in the countdown mode here. I am in the middle of executing the best plan ever. Minimalist Christmas! Small tree, simple lights, gifts only for the kiddos and two sweets. This cake and gingerbread cookies, just so Mika has something to put out for Santa on Christmas Eve. We are all enjoying it. A lot has happened in the last few days and we all needed to slow down. Hanging in front of the tv, popcorn and hot cocoa with marshmallows is what we will be doing. It is liberating to let go of my perfectly planned and controlled Christmas Eve dinner, a thousand and one cake and cookie with every decoration in and on the house imaginable. Cookies are made, we will be decorating them tomorrow. Cake is done. We are on the last season of The Office. Next we are starting Homeland. Ho Ho Ho. 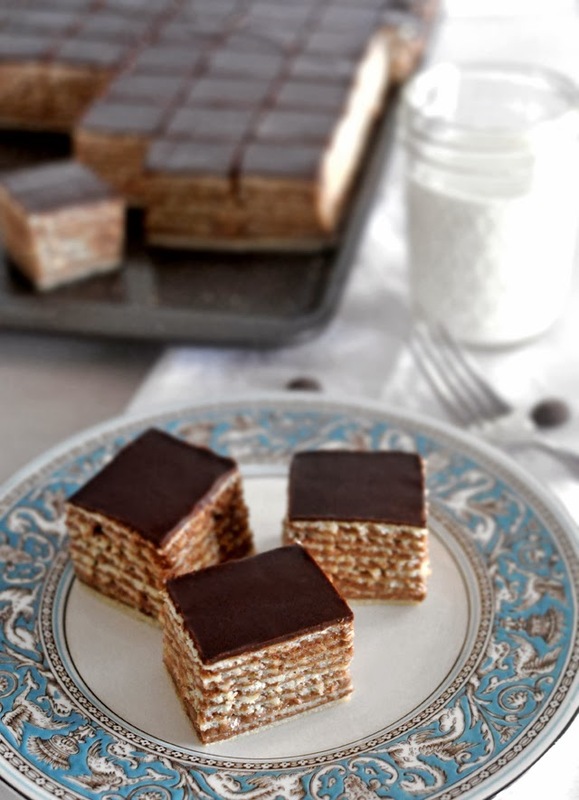 I recently posted an almost identical recipe for Bijela Madjarica that Teta Ljiljana made while I watched, trying to memorize every step so I can do it at home. It was always so hard for me to try to make it on my own, before seeing her do it. I hope my step by step pictures will help you if you are doing it for the first time. Put all of the ingredients into a bowl and combine with your hand. Work the butter in well and put into the fridge for a few minutes while you are preparing for the next step. Preheat the oven to 350 F. You will need a quarter size cookie sheet pan, or something similar in size. Butter and then flour the outside bottom of the pan really well, this is where you will bake your layers on. You only need to do this once before the first layer. You will be making six layers, perhaps seven, if you collect enough little scraps of extra dough when making the first six. The more the merrier. Take your dough out of the fridge and put it onto the floured work surface. Re-knead the dough and cut it into six equal pieces. Leave one piece out and put the rest into separate zip lock bags. 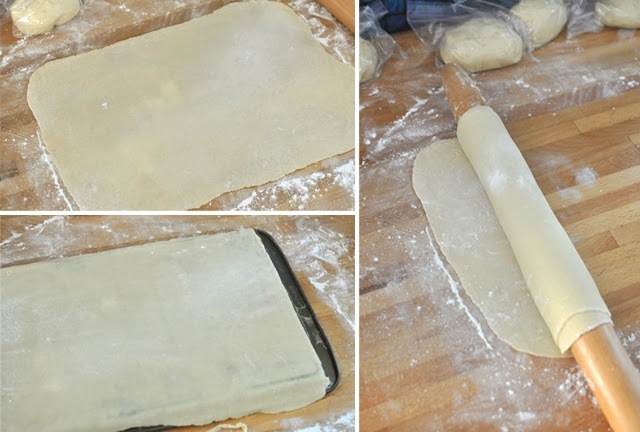 Constantly adding flour and turning the dough, roll it very thin, to less than 1/8", and until your dough layer is just little bigger than the back of your pan. Try to roll it into the rectangular shape the best that you can, this might take little practicing. Bake it for 10 to 15 minutes. You are looking for a barely visible darkening of the edges. Barely. Here comes the tricky part. You need to designate the space where you will pile up your cake layers and you need something like a big butcher board to weigh it down until they are completely cool (best over night). Bring your first baked layer here and smack the pan on the surface, it will release it so it slides off easily. 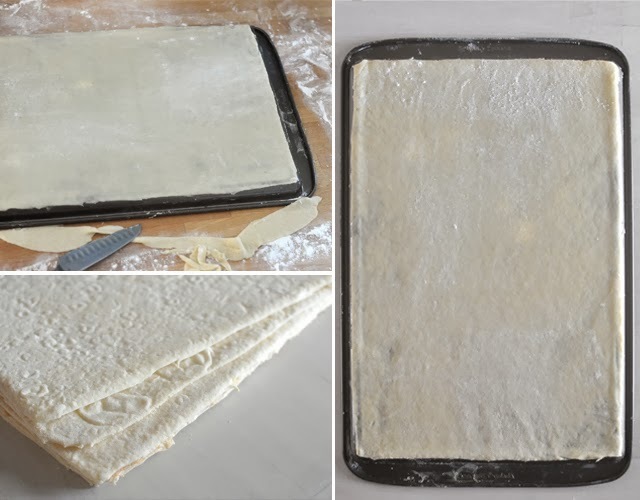 Cover the layer with the board and put the next rolled out dough layer on the cookie sheet, cut around and bake. It goes pretty quick, because while one is baking, you are rolling out the dough for the next one. When they are all done, hopefully you will have seven good cake layers to work with once the filling is done. It is crucial that they are completely cooled before even thinking of spreading the filling on them. about 130 grams of corn starch (1 cup), but you might need a bit more if you think your filling isn't thickening enough. 330 grams of butter, 3 sticks, room temperature. 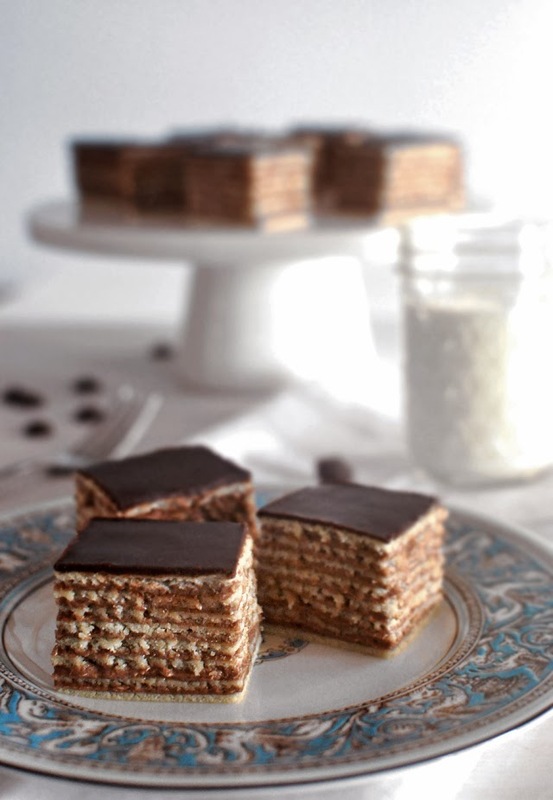 Since your cake layers need to cool of completely, I recommend making this filling one you are done with them, or even the next day. It makes everything seem much easier to tell you the truth. It also needs to be fully cooled off before adding the butter. 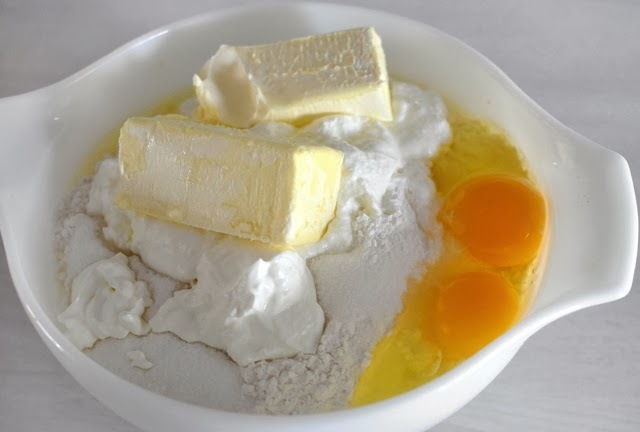 When you are ready, mix the butter until soft and creamy and then add the butter bit by bit into the cream while mixing it, its easiest if you do this in your stand up mixer. This is your filling and don't eat it all before it gets on the cake. It's yummy! To finish the cake, place the first cake layer on a board or a cookie sheet and take about 5 spoonfuls of filling that you will carefully spread all over. It needs to be pretty much the same thickness as the cake layer is so you will have to eyeball it. Put the next cake layer on and repeat adding the filling and do this until the last cake layer is on. Now, put the board you were weighing the cake layers with back on the top, and leave it for at least five hours, or best over night. You can finish it with just powdered sugar, or more traditionally, with a white chocolate glaze. Put all of the ingredients into a small pot and melt on low heat, constantly stirring. Let cool of slightly before pouring it over the layered cake. 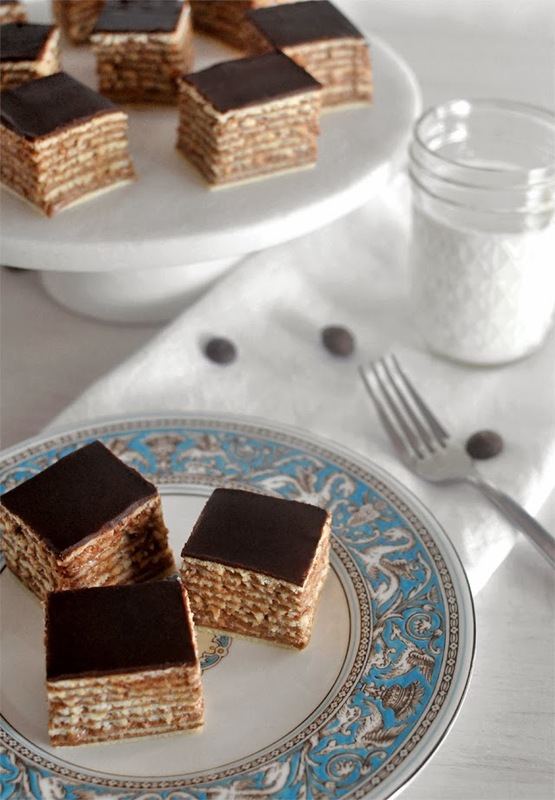 When ready to serve, cut very thinly the rims of the cake to remove any imperfections, then cut the whole cake in about two by two (or little smaller) inch cubes. We lived in Korcula for three years and the ladies were shocked when I actually made Madjarica for them - guess it's not something a guy normally attempts there. Turned out perfect. @Purabi Naha, thank you, I hope you love it, let me know how it turns out! I am so inspired by this recipe and cannot wait to make it. It is truly beautiful and so delicious looking. Look forward to following you!! This looks divine. Can't wait to give this a try. Can I make this with crepes as a variation?